When Olympic medalist Carl Lewis announced that he was going to run for the State Senate back in 2011, a sense of pride permeated his hometown of Willingboro. Even though Lewis was living and running in the eighth district at the time (Willingboro is in the seventh), Lewis' roots in South Jersey were legendary. He established the Carl Lewis Foundation, coached track for youngsters in Willingboro and was involved in physical fitness advocacy throughout South Jersey. Today, it was reported that when Lewis decided to run for the State Senate against Dawn Marie Addiego (who was originally appointed to the seat to fill a vacancy), Chris Christie threatened to withdraw support for a statewide physical fitness program in which Lewis was involved. You've got to give Christie credit - strong-arming a nine-time Olympic gold medal winner. There was another problem, though. Even though Lewis owned homes in the seventh and eighth districts and held a New Jersey driver's license, he had voted in California in 2009 and after a protracted court battle he was declared ineligible to run for the senate seat. New Jersey's residency requirements are somewhat ambiguous, and the courts ruled in the GOP's favor. Addiego subsequently ran unopposed, and was re-elected in 2013 when the Democrats stood up an unspectacular conservative candidate not much different than the incumbent. There was some talk about running Lewis for Congress against Jon Runyan in 2012, but at the time, Lewis said, "there is zero chance I'm running for Congress." 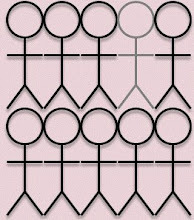 District 8 is a Republican district, and Lewis would by no means have been a shoo-in. But the fact that Christie tried to bully him out of running and undoubtedly urged the GOP to pursue the lawsuit is another example of the behavior of the governor that is being exposed by BridgeGate, and the Hoboken Sandy relief effort. This week, I spoke with Chris Walker, former Executive Director of the Carl Lewis Foundation and currently a Willingboro councilman. Walker emphasized that these revelations, although interesting in the context of Christie's travails, are not new, and that the threat to withhold support from Lewis' programs was reported in the press back in 2011. Walker went on to tell me that this is just another example in the pattern of Christie's behavior, and that he felt that the current investigations into that behavior are justified. Lewis is now living in Houston, working as a volunteer track coach at his alma mater, the University of Houston, and serving on several Boards of Directors for local agencies there. New Jersey's loss is Texas's gain. One has to wonder how much of this is due to Christie and the GOP. 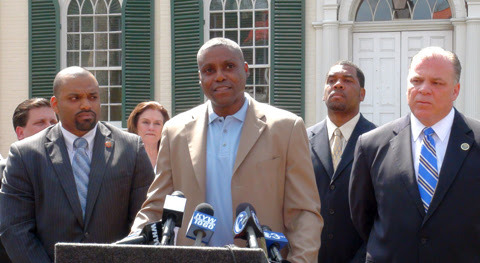 Photo: Carl Lewis at his announcement to run for NJ Senate in April 2011. Senate President Steve Sweeney is at the right of the photo and Chris Walker is between Lewis and Sweeney.